We can air seal a wide variety of places like your plumbing and wiring penetrations through floors, walls, and ceilings. Air leakage happens throughout the home as the air you pay to condition slips through joints, cracks, and other openings. This process naturally forces your heating and cooling system to work harder and will make your home too cold in the winter and too hot in the summer. Home Solutions of Iowa are experts in identifying the sources of these problems in your home and providing complete air sealing services. We can help you eliminate leaks and make your home more comfortable and efficient. If you’re interested in air sealing for your home, call us today to get started! 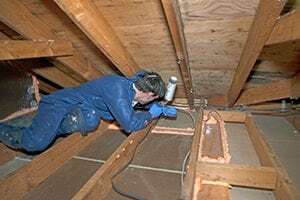 If you’re having problems with uncomfortable rooms and high heating and cooling bills, the home insulation experts at Dr. Energy Saver are here to help. We can test your home for air leakage problems and provide you with the air sealing services you need. Contact us today for a free estimate! We can test your home for air leakage problems and provide you with the air sealing services you need.